Don’t carve – just bite! Covered in orange-colored Jelly Belly jelly beans, these amazing cakes are the spitting images of your favorite autumn gourd. And no seeds to dig out! Tint the vanilla frosting pale orange with the food coloring. Trim the tops of 6 cupcakes to make level. Spread some of the orange frosting on top of one of the trimmed cupcakes. Press cupcakes together, trimmed sides touching, to create 3 tall pumpkin shapes. Working on one tall cupcake pumpkin shape, cover the cupcake with some of the orange frosting. To make pumpkins with horizontal rows start at the base of the cupcake and arrange a row of Jelly Belly jelly beans horizontally around the base. Continue adding horizontal rows to cover the entire double cupcake pumpkin. To position beans vertically, start out with a straight row running from the top of the cupcake to the bottom. 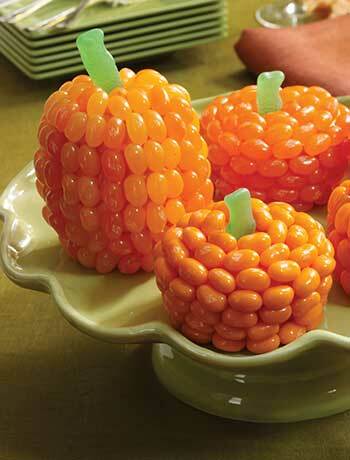 Continue with rows of different shades of orange jelly beans to create the ribs of the pumpkin. Repeat with the remaining single and double cupcakes and Jelly Belly beans. For the stem, cut the Jelly Belly Chewy Fish in half crosswise. Using the tail half, insert the cut end into the top of the cupcakes to make the pumpkin stem.